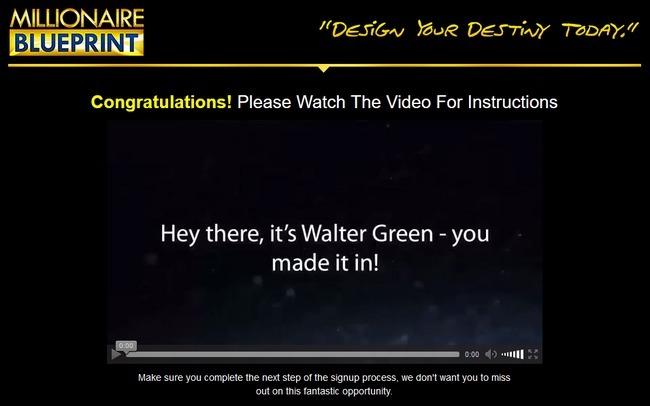 Millionaire Blueprint is one of the binary options robots that claims to change your financial destiny. Is it too good to be true? Is Millionaire Blueprint a scam? We’ll find out in this review. 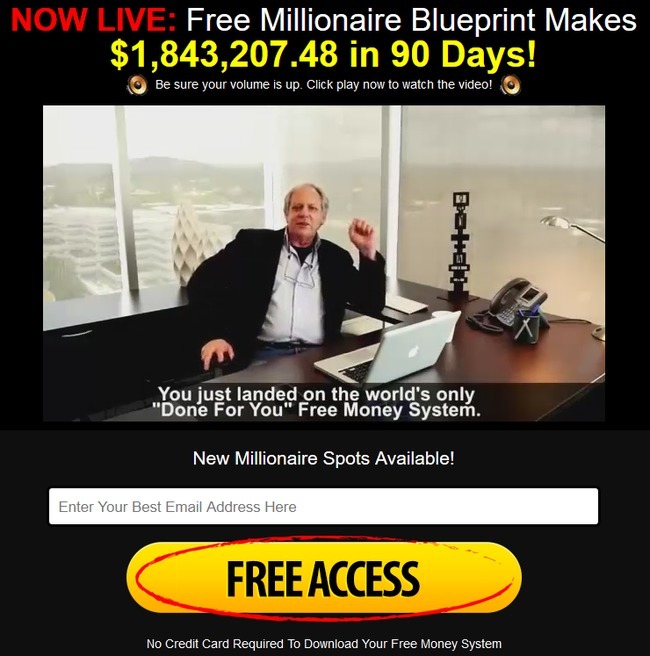 Like many other “get rich quick” programs, Millionaire Blueprint makes a bold statement right off the bat – making $1,843,207.48 in just 90 days! 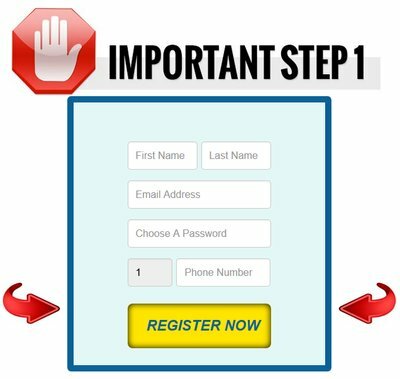 There’s nothing much in the homepage of Millionaire Blueprint, just an overused auto-play video tactic that tries to lure you into giving your email address. The video is not short, it’s a 32-minutes video, but I spent the time to finish it anyway for the sake of this review. Unfortunately, most part of the video consists of hypes and unrealistic story of how an unemployed man who couldn’t pay for his mortgage doubled his money again and again trading binary options on the side. Some people may take it as a real life-changing story, as the acting looked realistic and the story may seem compelling for someone who is not familiar with the online scams. Actors have been used to present this opportunity, and the sales video is fictitious. That means the earnings presented in the video are not real, and the whole life-changing story is a fake, too. According to their disclosure, although Millionaire Blueprint talks about the tremendous earning potential of binary options, still, they should not be seen as a recommendation to trade binary options. They know very well that binary options is an extremely risky trading instrument. To make sure everyone is on the same page, we’ll explain how binary options work before continuing with the review. Binary options is one of the simplest forms of trading. Instead of reading up news and analyzing charts, you only need to choose one of the two options with binary options- Yes or No. They pay a predetermined amount, usually a percentage of the amount you are betting, depending on whether or not the event occurs when the contract expires. For example, if I buy a binary options contract that expires in 5 minutes, and I predict (guess) that the price will be higher. After 5 minutes, if the price is indeed higher, I get to keep a certain percentage of what I bet, and keep my initial investment amount. If I guess wrongly, I lose the entire sum of my bet. Does it sound like gambling to you? It sure does for me. It is extremely easy to execute, but profiting on it is an entirely different story. Even if you manage to get it right 50% of the time, you are still losing money. The odds are never in your favor. Back to Millionaire Blueprint. I wouldn’t say Millionaire Blueprint is a complete scam, as it does outline the steps required to start trading binary options with their software, unlike many other binary options robots that don’t even bother to disclose that you need to make an initial deposit to use them. However, it’s undeniable that Millionaire Blueprint uses exaggerated earning potentials and try to mislead unsuspecting users. While the trading robots is free to use, they fail to present the risks of losing your entire investment sum in their sales materials. 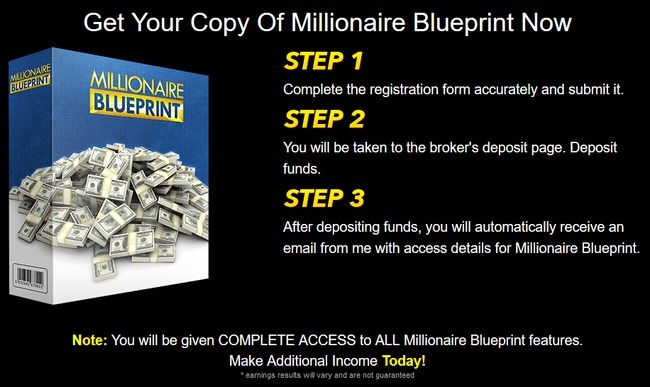 The Millionaire Blueprint makes money by referring you to their designated brokers, where you must register through them to use the software. Within the sales page, you are required to fill up a form to register an account with one of their designated brokers. Once you have an account with their broker, you need to fund it before you can use the software to automate the trades for you. The minimum funding for most brokers is $250. It’s an industry standard for binary options brokers. I was assigned to BinaryBook.com, but I’m not sure if Millionaire Blueprint has other affiliated brokers. As with many other brokers, the minimum deposit of BinaryBook.com is $250. Again, this is an industry standard, and Millionaire Blueprint did mention about funding the trading account to get started, so this shouldn’t come as a surprise. Should I Try Millionaire Blueprint?